The classic thickener can be dark and flavorful or light and delicate. A rich béchamel sauce, a classic clam chowder, and a spicy gumbo may not seem to have much in common. 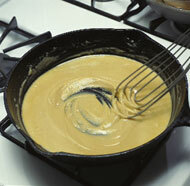 Yet all three are thickened with a cooked mixture of flour and fat known as roux. 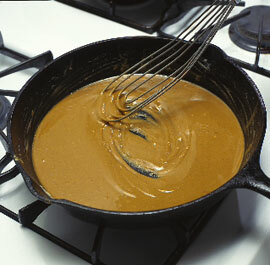 Roux (pronounced “roo”) is one of the cornerstones of sauce-making and it’s made in three versions: white, blond, and brown (see photos at right). Most recipes call for equal weights of fat and flour, but making roux is not an exact science. Experienced cooks often add the flour until it looks right. A colleague describes perfect roux as “wet sand at low tide”: moist but not runny. As a roux cooks, it gets darker and its flavor becomes more complex. It’s important to understand, however, that as a roux colors, it loses its ability to thicken because the starch in the flour is broken down by the heat. You’ll need more brown roux than blond roux to thicken the same amount of liquid. A truly dark roux won’t thicken at all. 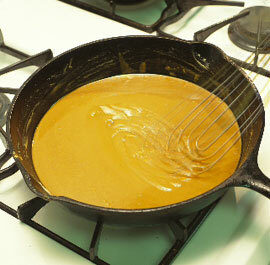 Once a roux is cooked to the proper color, gradually add the liquid your recipe calls for, whisking constantly. I prefer to warm the liquid slightly first. If it’s too cold, you’ll spend extra time whisking while the sauce comes to a simmer. But if the liquid is too hot, the sauce may thicken so quickly that it becomes lumpy. Bring the mixture to a gentle simmer, skimming any foam or fat that rises to the surface.